Talk to 3 Lawyers for the Price of One! We thought... since most phone consultations with a lawyer last only 20 minutes, why pay by the hour? Instead, consult 3 lawyers for 20 minutes each, and pay for only 20 minutes every time. That's 3 phone consultations for the price of one! Lawbench gives you the exclusive ability to request a phone consultation with a lawyer in chunks of 20 minutes. Make your own judgement and select the appropriate duration for your individual situation. Fill the form displayed on the right. Pre-pay the low consultation fee on Lawbench. The law firm will get in touch with you in 1 business day. Get 20 minutes of a lawyer's time for only $59, exclusively from Lawbench! Fill the form below, pay the low consultation fee, and then the lawyer will get in touch with you in 1 business day. 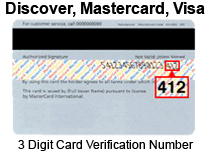 The 3 digits displayed on back of your credit card.